Nice is the seat of Chambre de commerce et d'industrie Nice Côte d'Azur. It manages both the Nice Côte d'Azur Airport, the Cannes-Mandelieu Airport as well as the Port of Nice. Nice has the second market of national interest of France, the first port cement-manufacturer of France as well as a great number of museums and hotels. Nice is the second most popular French city among tourists after Paris, which, combined with the difficulties of the terrestrial communications at long distance (because of the Alpes), allows Nice to have the second busiest airport of France in terms of passenger numbers (close to 10,000,000 passengers in 2005). 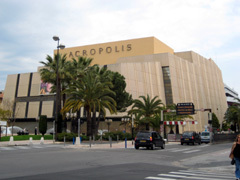 Nice has two conference centres, Palais des Congrès Acropolis and Palais des Congrès de Nice. Nice has several business parks; l' Arenas, Nice the Plain, Nice Méridia, Saint Isidore, Northern Forum. There are also several shopping centres in Nice like Nice Star, Nice TNL, Nice Lingostière, Northern Forum, St-Isidore, the Trinity (around the Auchan hypermarket) and Cape 3000 with Saint-Laurent-du-Var. Sophia Antipolis is named after Sophie Glikman-Toumarkine, the wife of French Senator Pierre Laffitte, founder of the park, and incidentally, Sophia, the goddess of wisdom, and Antipolis, the ancient Greek name of Antibes. According to the estimates of INSEE, the population of Nice was 347,900 inhabitants on January 1 2005. Nice is thus the fifth largest city in France, behind Paris, Marseilles, Lyon and Toulouse. The Agglomeration of Nice, defined by INSEE, is home to 888,784 inhabitants (fifth of France) and its urban surface totals 933,080 inhabitants, which makes it the sixth largest in France. The city saw a big demographic rise in second half of the 19th century, a period when the population more than doubled, mainly due to Italian immigration. At the beginning of the 20th century, this rise intensified with the arrival of internal immigrants from the County of Nice itself. After the First World War, the city had a strong increase in population. Immigration was again the reason of this growth. The hotel industry and that of the construction industry, in full strength in the 1920s, attracted world more and more and thus made it possible for Nice to become a town of national importance. In 1921, Nice then became the eleventh town of France, then in 1931, the eighth, before being classified with the sixth rank in 1946. The population increased very quickly in the 1950s, with the arrival of sixty thousand people. Thereafter, the city reached its current demographic level thanks to the repatriates of old French colonies, in particular those from Algeria. Since the 1970s, the number of inhabitants has not changed significantly; the relatively high migration to Nice is compensated by a negative natural increase of the population. Nice has a high proportion of elderly people. Currently, the population of the city is growing again, the reason of which is undoubtedly heliotropism. Nice is projected to have 350000 citizens in 2005, 360000 in 2008, 370000 in 2012.